The twenty-ninth match day of the Spanish Primera will continue with some Sunday successive games. In one of them Real Valladolid will face Real Sociedad at their Estadio José Zorrilla. Actually both sides underperform. Which one will win tonight? Before the March break Real Valladolid have interrupted their black line by beating Eibar at away. Fabian Orellana from Eibar pounced on a loose ball inside the box and beat the goalkeeper with a shot into the bottom left corner. He made it 1:0. The opponent has scored both decisive goals in the stoppage time. Daniele Verde from Valladolid won the battle of wills and sent an unstoppable penalty past Marko Dmitrovic into the bottom right corner. In a few minutes Sergio Guardiola made a great solo run and pulled the trigger from inside the box, beating Marko Dmitrovic with a strike into the bottom left corner. He made it 1:2. Earlier the White and Violets lost four times in a row with the total score 2:10. Commonly, they are sixteenth in the table and risk to be relegated back in Segunda. Their basic statistics include seven wins, eight draws and 13 losses, 23 goals for and 39 goals against. Their head coach Sergio Gonsalez has three sidelined people. Pablo Hervias, Luismi and Toni are still injured. 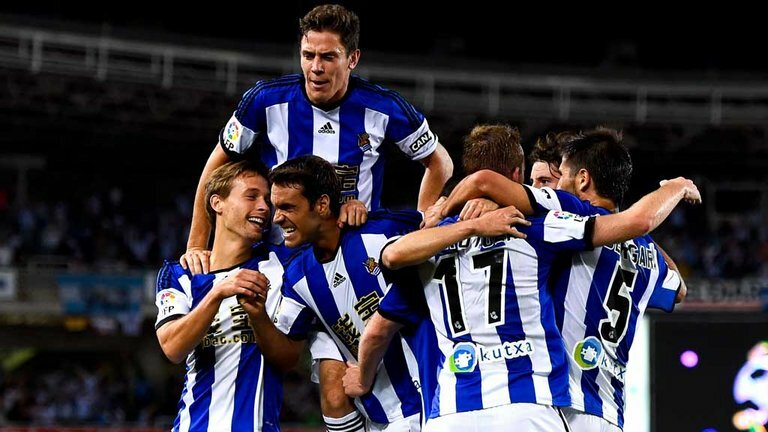 Real Sociedad won for the last time on February 16. There the Royal beat Leganes at their Anoeta Stadium. Totally, the guests have nine wins, the same number of draws and ten losses, an equal number of goals for and against, 33 goals for each. They are situated in the mid-table, they are tenth among 20 clubs. Last round they played with a draw against Levante. Theo Hernandez from Sociedad passed the ball to the feet of Adnan Januzaj, who had an empty net in front of him and had no problems in tapping the ball in. 1:0. Jose Campana from Levante produced a cross from the resulting corner and found Borja Mayoral inside the box. He pulled the trigger and scored, sending the ball into the bottom right corner. What a brilliant finish. 1:1. The visitors have two sidelined people. Asier Illaramendi is injured, Mikel Merino is suspended.